Hi there and welcome to Bagsandsuitcases.com! My name is Petra and I’m here to help you find the best luggage for your specific need, whether you’re traveling domestically or internationally, whether it’s for business or for fun, short stay or long stay, and of course, I’m trying to show you the best options for your budget. I’ve always had the urge to travel and see and experience new things. As long as I can remember, I would get excited about getting ready to hop into the car or on the train or on a plane. I grew up in a small country town in Germany, so going to a bigger city would be very exciting and I’d constantly ask whether we were still in the same country as I couldn’t fathom the world being so big. First my travels consisted of mainly going for holidays within Germany or to countries close to home, such as The Netherlands. Later on I would travel further and further, exploring cities and other cultures until one day I decided to go to Australia for work and travel. To make a long story short, I’ve been living in Australia for quite some years now and of course have been traveling back and forth and around the world quite a bit. What To Pack For One Year? 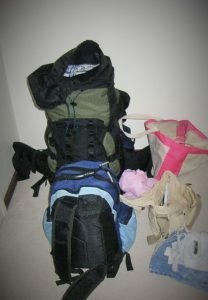 When I first decided to go to Australia for one year, I pretty much packed up everything I owned. What I couldn’t pack, I put into storage. I ended up taking one massive suitcase which weighed 62 lbs (28 kg) (I was allowed 44 lbs (20 kg), but was very lucky not having to pay for more) and contained a lot of things I thought I’d definitely need for one year living out of a suitcase, but, surprise, surprise, I didn’t touch many of the things I carried around with me. I had to carry all of this! Part of the trip was supposed to be a typical backpacker experience so, of course, I had to buy one of those massive backpacks, and, because I thought that wouldn’t be enough, I bought a small backpack as well. The big one I filled up to 35 lbs (16 kg) and the small one contained 24 lbs (11 kg). Crazy, you think? Yep, definitely so. And guess what? Of course, I didn’t even need all of that stuff either. But I still had to carry all of it around with me. After many years of traveling between countries, and continents, I have accumulated quite a few luggage options, got rid of quite a few suitcases, backpacks and random bags, kept the handy and sturdy ones (and some pretty ones), and learned how to pick the best option for any kind of travel experience I might plan. I suppose you could say I’m somewhat of an expert when it comes to packing your bags. So Many Options, Which One To Choose? I know exactly what it’s like when you’re wondering which luggage option is the best, or cheapest, or easiest in whatever kind of travel you’re wanting or having to do. And there are so many options that it can easily do your head in ahead of your journey. That is why I have decided to share my knowledge and research the options available so you don’t have to stress about it and hopefully will have an easier time deciding the best option for you. So if you ever need a hand or have any questions, feel free to leave them below or email me at petra@bagsandsuitcases.com and I will be more than happy to help you out. Thank you for the glorious information. I do some traveling not a lot. But most of my family lives hours away so going to see them is fun. And there is always over packing involved. I really like the spinner ones I think it would best fit for me. I currently have the roller ones and it seems like they want to turn and the wheels are coming loose. I want to thank you for your insight on luggage. It is very helpful. yes, packing too much seems to be an issue for lots of people, myself included. Remember that spinner sizes include the wheels, so you ultimately get less room and also make sure to check the quality of the wheels when buying a spinner (4 or 8 wheels). Let me know if you need any help. Have safe and fun travels! We go to travel like 5 times a year, mostly wildlife and forest ones, for at least a week. I see we can have good tips here, also we will share it with friends of us, I will bookmark it for further tips and posts of you! Wow I could not imagine packing everything for one year in a bag. Although I bet the feeling was exciting and exhilarating to minimize so much. We really do not need a lot of the materialistic things that we own. It must be wonderful to just roam and explore. I definitely have wanderlust now. Thanks! Thank you. Yes, it was exciting and nerve racking and everything at once. But it was sooo worth it! I love your experience. That is such an incredible story and one that I think many people are jealous of. In your baggage use, have you come across douchebags? (Weird name I know) Company was founded or confounded by Jon Olson. Seems like a good product but there are so many bag companies out there it’s pretty hard to tell. I have come across some douchebags before, but not the luggage lol. I’ll have a look into it. Thanks for telling me. I’m always interested to see what’s out there.